With all of the new features packed into iOS 11, High Sierra is something of a disappointment. It’s a bit like getting socks and underwear for Christmas. You know it’s necessary and you’ll be happier six months from now when you don’t have to walk around with your toes poking out of holes, but for now, you wish there were a few more video games and action figures mixed in with the bunch. That’s partially a result of a yearly upgrade cycle — Apple can’t reinvent the wheel each time out. But more than that, this latest version of macOS is about rebuilding the software’s foundation. There are a few surface level enhancements, most notably to Safari and Photos, but the fundamental updates to the operating system are almost entirely below the surface. High Sierra is a sort of recommitment to macOS. Past upgrades found the company hedging closer to iOS and had many wondering if this was all leading to a convergence of the company’s two operating systems. With 10.13, the company brings the first new file system since the Mac’s earliest days, a new video compression technology for 4K and the arrival of Metal 2, the latest version of the company’s graphics API. Many of the upgrades are about futureproofing the OS. High Sierra marks Apple’s first real commitment to virtual reality support, for instance. As such, the absence of day to day changes is going to be pretty negligible for many users. When it comes to things like graphical enhancements, the difference may actually be greater on older systems — the good news there is that, like its predecessor, High Sierra is compatible with systems dating as far back as 2009. For these reasons, it would perhaps be misleading to call this a “review.” And besides, as with the last several macOS upgrades, High Sierra is completely free — given the lack of visible features, it would be a harder sell if it wasn’t. As it stands now, there’s little reason not to take the leap. Though, given all of the big upgrades on the backend, you’re going to want to make sure you set aside a significant chunk of time to install this one. High Sierra officially hits the Mac App Store today. Here’s what you can expect. The biggest update to macOS is one you won’t notice. Crazy to think, but HFS+ is a legacy system that’s been an underlying technology of Apple operating systems for around 30 years. It’s hard come up with too many consumer electronics technologies with that kind of staying power, and it was long overdue for an upgrade. The straightforwardly named Apple File System (APFS) was first unleashed on the world in iOS 10.3. At the time, the update’s most immediate impact on the end user was the fact that it might free up some storage space — something that’s obviously at much more of a premium on a mobile device than a PC. Here, the company is promising more stability. The new file system, which is being rolled out across Apple’s various lines, is optimized for flash storage (and won’t be available for Fusion Drives right away). The new file system has native encryption built in for added security, encrypting each file individually. The new crash protection records data in multiple locations for added protection against loss of data, and document saves have been improved to protect against system failures like loss of power. There’s a smattering of other improvements, like faster Time Machine saves and generally more responsiveness across the system. The big thing here, however, is the idea of futureproofing the system, including the ability to handle a huge number of files on a system. It’s also about delivering a long overdue update to a system that was having trouble keeping up with advances in current technologies. Metal 2 brings the biggest changes from a graphics perspective — but as with the file system, most won’t be immediately apparent on installation. Apple is promising smoother animations on this end, but testing the final build on a brand new MacBook Pro, I didn’t really pick up on much of a difference. This is likely another spot where the difference will be more pronounced on an older device that can benefit more from additional from better GPU usage on the low end. Most of the latest Metal’s benefits will come over time, as developers tap into Apple’s new API. The update pushes Apple a step closer to offer true gaming machines — a category that has been entirely dominated by PCs over the last several decades. The new version brings increased machine learning to the GPU and promises more robust graphics. It also adds support for virtual reality rendering and support for external GPUs, so Mac users can offload some of that heavy lifting to peripherals. On the video side, built-in support for High Efficiency Video Coding (HVEC) maintains the theme of freeing up extra space. The compression technology is the successor to H.264, lowering bit rates, while supporting higher quality 4K video. According to Apple’s numbers, the new standard occupies upwards of 40-percent less space. Photos gets the most visible changes this time out. Up front, you get a new, persistent sidebar that includes a history of photos you’ve imported, along with media organized by category: Live Photos, panoramas, selfies, and animated GIFs. That last one is newly supported by Photos, with Apple having prioritized its own proprietary Live Photos technology in the past. The toolbar up top now includes tabs for further filtering by Photos, Moments, Collections and Years and photos can now be organized by dragging and dropping. They can also be exported by being dragged onto the desktop — a dead simple feature Apple really ought to have included several updates ago. The most important upgrades to photos are in editing. In fact, Apple is slowly turning Photos into a solid editor — a change over past versions where it was most a preview/gallery application. I spent some time playing around with Live Photo editing tools and was impressed by what you’re able to do here with a number of filters, simple effects and a timeline. Live Photos still haven’t moved too far from proprietary novelty — animated GIFs are still the far more universal option. But these new tools make the technology far more flexible letting you adjust how photos loop with effects like Bounce. Photo filters have gotten a pretty significant revamp as well, putting the desktop version more on par with what we’ve been accustomed to using on mobile. 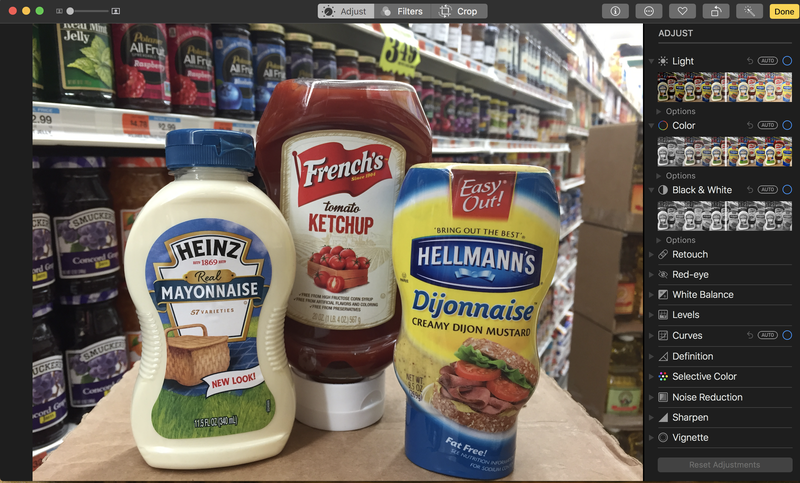 Photos now also includes direct access to key editors like Photoshop and Pixelmater, so you can open them directly through Photos and save the changes in the app. Apple’s browser gets the other key updates in High Sierra, most focused on privacy and intrusive ads. The browser now stops audio on autoplay ads, one of the key sources of madness in the modern world. Interestingly, Apple will keep the video going — as it notes, its own website uses animations — but if you haven’t started a video yourself, it will pause it and toss a big proprietary play button on top of it. You can also make exceptions for those sites you don’t mind autoplay from. The browser’s Intelligent Tracking Prevention removes cross site tracking — so if, say, you look at a pair of shoes on Zappos, they won’t follow you around on every page you visit. It doesn’t do away with cookies entirely, though, keeping tracking that’s relevant to the site of origin, so your data isn’t cleared out every time you leave. Safari also offers the ability to choose who can access the computer’s camera, location and microphone on a per site basis and lets users set specific zoom levels for different sites, so it’s the same size each time they visit. Mail gets a couple of updates — including improved search results based on senders and how frequently messages are read. There’s also a new full screen view that Splits the display between the inbox and the message you’re currently writing. 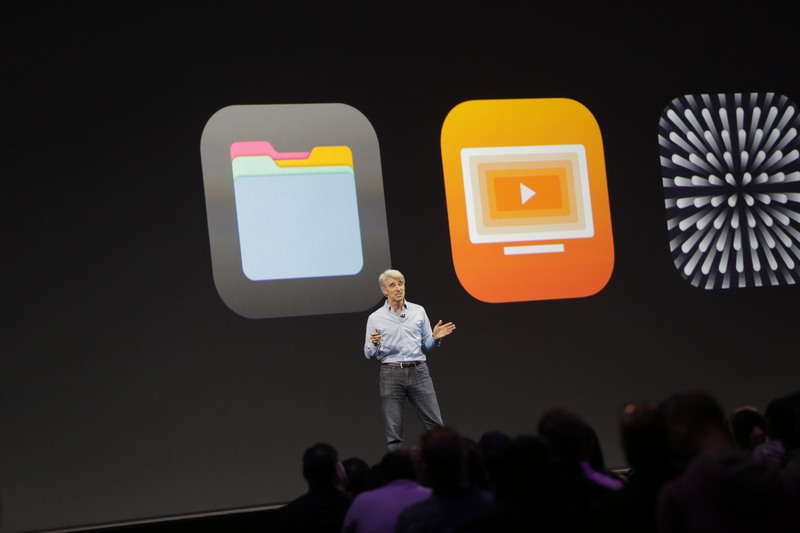 Oh, and Apple has improved compression, so messages take up to 35 percent less space. As with iOS 11, Siri’s got a new, improved voice. Apple’s assistant also has improved music playback functionality, assuming you have Apple Music — just in time for the HomePod, naturally. Files copied on one Mac can now be pasted on a nearby one with the same log in. It’s a bit like a much more simplified AirDrop. 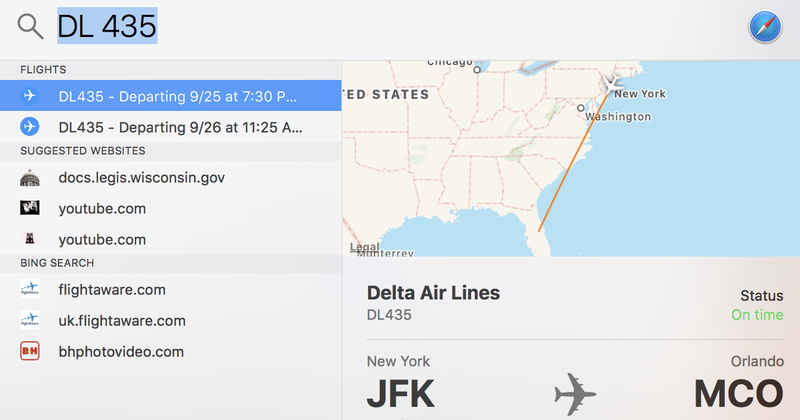 Spotlight now includes flight information status. Notes include tables and pinning to keep a specific message up top. FaceTime lets users take Live Photos on from the other person’s camera — I’ll be honest, this one still weirds me out a bit. But both parties are notified when this occurs, a la Snapchat. In terms of outward facing features, this is a fairly disappointing upgrade. The tweaks to Safari and Mail are nice, but they’re more the stuff of a smaller point upgrade. High Sierra’s biggest features are those you won’t see right away — and in some cases might not even notice over time. It’s like a congressional infrastructure bill — it’s important and necessary for the future, but it’s not the kind of thing that gets people excited to tune into CSPAN. But this upgrade is an important one for keeping macOS relevant and preparing the operating system for the future. It marks the long-awaited end of the company’s long outdated file system and takes steps toward improving Apple’s status in the gaming world. It’s undoubtedly worth the price of admission (free) — just make sure you give yourself sufficient time to install.